The most amazing Laguna Beach tidepools! 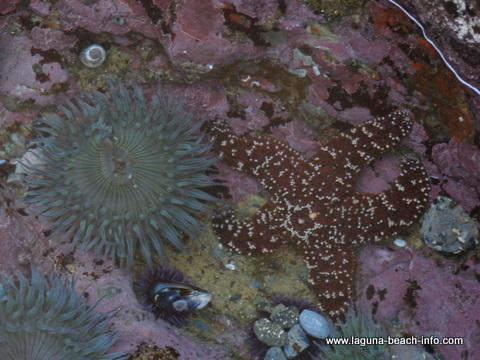 Crescent Bay is where you'll find the most amazing tidepools and marine life in all of North Laguna Beach! Most visitors and even many locals in Laguna Beach walk the shoreline below Heisler Park to admire the tidepools. Its true- you’ll find plenty of easily accessible wildlife there. And if you wade out into the water you’ll find much more than hermit crabs that scurry from crevices in the rocks. 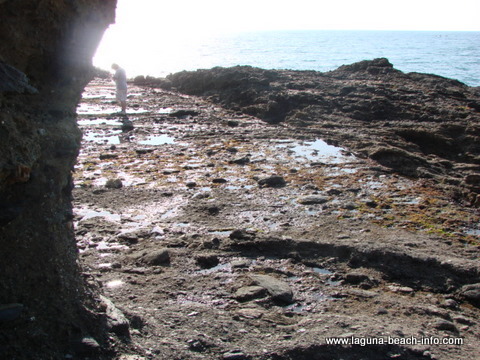 But if you really want to explore the BEST tidepools in North Laguna, come visit Crescent Bay Beach. I originally found Crescent Bay during a class assignment from UC Irvine. We were assigned to take photos of S. purpuratis, more commonly known as- purple sea urchins. I drove down to this beach expecting to find a few urchins and the regular complement of hermit crabs. To my amazement I found tidepools prolific with all sorts of marine life. Huge yellow, purple, and orange starfish grasp securely against the crashing tide. 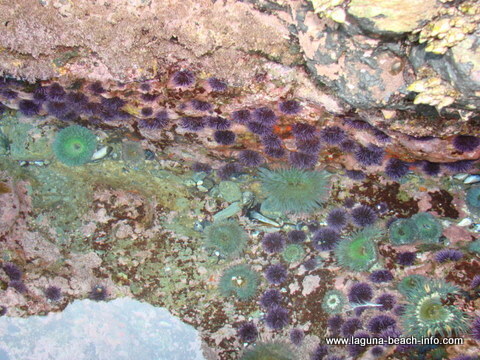 Mussel colonies and gooseneck barnacles cover expansive surfaces of exposed rocks. 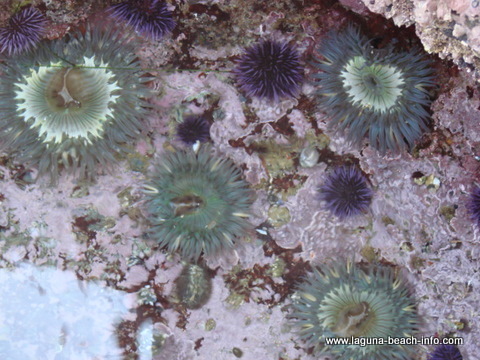 Thousands of sea anemones and urchins thrive in countless sheltered pools. In some pools, small fish are temporarily trapped by the changing tides, waiting to be set free again. And everywhere you look, there are hermit crabs and rock crabs scurrying from nook to cranny. There never-ending motion is only surpassed by the rhythmic crashing of the tides. Without a doubt the tidepools at Crescent Bay are worth seeing. After you descend the steps on the North end of the beach, or walk down the ramp on the South entrance to Crescent Bay Beach, turn left. You'll be facing the south end of the beach. At low-tide, this is where you'll find the best Laguna Beach tidepools. While you're there, look carefully before you step and make sure to step lightly. There is delicate intertidal marine life everywhere you look! 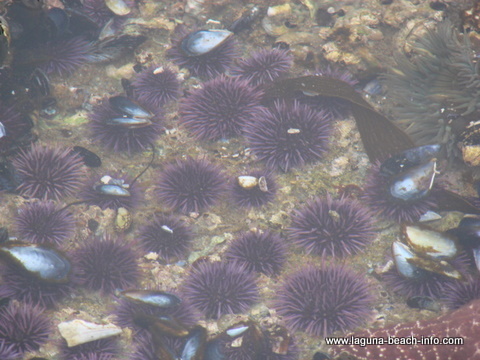 Here is another colony of purple sea urchins that flourishes on the rocks of the Crescent Bay Beach intertidal zone. 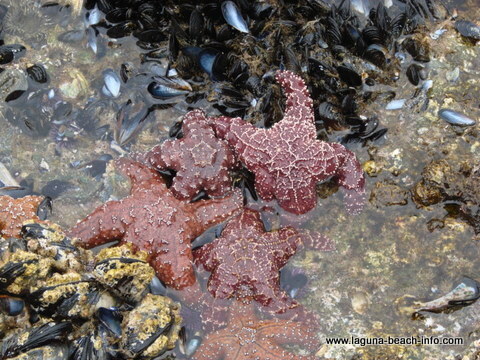 One of the more recognizable invertabrates in any tidepool is the Starfish! And this area is crawling with them! Whether you bring the kids out to entertain them for the day, or bring your sweetheart for a unique date that they'll never forget- come see the Laguna Beach tidepools at Crescent Bay Beach! You will not regret it! Nearby Crescent Bay Park provides beautiful views of the bay, with grassy areas, and scenic overlooks. And, since its a little more out of the way, its usually significantly less crowded than other parks in Laguna Beach. There is free parking for Crescent Bay along Cliff Dr. This is a residential neighborhood, so make sure to not block anyone’s driveway. The South entrance ramp to the beach is located off of Cliff Dr.
Share Your Crescent Bay Experience or Review! Do you have a great story, experience, or photos from Crescent Bay? Share your stories and pictures from the Laguna Beach tidepools here! 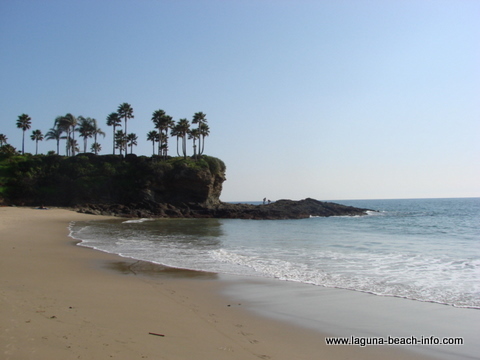 To get to Crescent Bay in Laguna Beach, take Pacific Coast Highway north (from Main Beach) until you pass Chiquita St. Take the next left Cliff Dr.
You'll see the beach access ramp straight ahead. There is a second staircase leading down the beach farther to the Northwest descending from Circle Way. Return from Crescent Bay Tidepools to Laguna Beach beach page.